Leases are agreements allowing someone to use property temporarily. These agreements differ from sales agreements in a number of important ways. 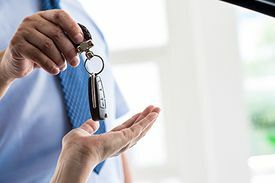 Client wants to know their rights regarding a leased car for which the dealer now wants payments, even though the car has been returned to the dealer. Client cannot make further payments on a car lease and wants to know their rights if the car is repossessed. Leasing agreements allow someone to use property temporarily. This arrangement is distinguished from sales agreements, where the intention is usually to allow the buyer to take permanent ownership of the property, or at least give the buyer a right to obtain ownership. Leases are usually for a fixed period of time, after which the property is returned. Often, leases may be extended or there may be an option to buy the goods outright. Alternatively, goods can be rented on a monthly basis but for an indefinite period of time. Leases are common in transactions involving housing, cars and furniture. This section deals generally with such leasing rights. Leasing agreements, particularly car leases, can be complicated documents. Some of the more important provisions include responsibility for maintaining the vehicle and the condition of the vehicle upon its return. A particularly important aspect of car leases is the consumer’s financial responsibility when the contract is terminated. A lawyer should generally be consulted on car leases. This section contains only a brief overview of the law. Several statutes touch upon the rights of consumers concerning leasing agreements. Under the Sale of Goods Act (see the section on Sale of Goods Law), the protections for consumer purchases also apply to consumer leases. Under section 18, for example, the implied condition as to the durability of goods applies to both sales and leases; under section 20, the protection against waiver of rights applies to both sales and leases. The trade practices requirements of the Business Practices and Consumer Protection Act apply to consumer leases (see the section on Unfair or Deceptive Practices). The Personal Property Security Act (see the section on Security Agreements) applies to most consumer leases. It clearly applies to all leases in which the consumer has the option of buying the property. The Personal Property Security Act also applies to most leases that do not have such a purchase option if the lease fits within the extended definition of “lease for a term of more than one year” (see the definitions in section 1 of the Act). A lease for a term of more than one year includes renewable shorter-term leases as well as leases with an indefinite term. Of significance are the consumer goods remedies in Part 5 of the Personal Property Security Act, such as “seize or sue” and the “two-thirds rule”. These provisions apply to leases of consumer goods with a term of more than one year if the lease secures payment or performance of an obligation. Such leases are commonly called “security leases”. Security leases are treated differently under the law than “true leases”. True leases are strictly rental agreements and do not secure payment or performance of an obligation, even when they have a term of more than a year. Significantly, Part 5 of the Personal Property Security Act does not apply to true leases. Typically, a client who has defaulted on a car lease will have received notice from the lessor threatening to both seize the vehicle and sue for any deficiency. While you should determine if the lease is a security lease or a true lease, an assertion by the debtor that the “seize or sue” provisions of Part 5 of the Personal Property Security Act apply is usually enough to discourage the lessor from pursuing both remedies, and a settlement can be negotiated. See also “Breaking a Lease” from the Tenant Resource Advisory Centre and People’s Law School’s page on leasing a car. This page was last edited on 12 October 2018, at 12:25.